What’s better than a great meal? A great meal paired with a beautiful view. It’s no secret that our region is home to diverse and breathtaking vistas and vantage points. Combine them with a mouthwatering dish or drink in hand, and you’re in for a moment you’ll never forget. With impressive skill, our area chefs and restaurateurs have worked together to bring the finest cuisine to these picturesque spots. Locals and tourists alike should take advantage of these supreme dining destinations, and there’s no better time than the summer to enjoy the natural landscape. Whether for a celebratory dinner or a casual bite to eat, you can add these venues to your list of palette- and eye-pleasing stops to make. Anderson Japanese Gardens, 318 Spring Creek Road, Rockford. BkL daily, Mon.-Fri. 8 a.m.-2 p.m., Sat.-Sun -3 p.m.
Rockford’s Anderson Japanese Gardens is one of the highest-quality Japanese gardens in North America, and its onsite restaurant puts diners right on top of its calm and tranquil environment. Fresco at the Gardens applies its Italian meaning of “fresh” to every facet of its operations. The Benny Salamone family of Franchesco’s Ristorante opened the breakfast-and-lunch eatery in June 2015 to bring seasonal, organic and locally sourced dishes to Rockford. The north side of the Visitor Center uses floor-to-ceiling windows to offer views to every table throughout the changing seasons. During the summer, diners can sit on the outdoor deck surrounded by the blooming flora and gentle sounds of the streams and waterfalls below. A second deck will open this summer for additional seating. Fresco is also bringing back some popular dishes, including the Southwest Chicken Wrap and Mango Berry Salad. Altogether, the 40-item, all-day brunch menu celebrates farm-to-table dining with local market fare. Van Laar’s Fruit Farm, Anderson Organics and other small and local farms provide fresh produce, while Rockford Roasting Co. and Chai Town Tea supply the hot drinks. The coffee and juice bar also uses fresh produce for on-the-go snacks and beverages. Its FrescoFit options add homemade smoothies and juices, including The Hulk, a blend of kale, mint, honeydew and apples. For 14 weeks every summer, Tuesday Evening in the Gardens brings live music to the pavilion. Fresco serves a condensed menu during these special summer performances right next to the stage. Ironworks Hotel, 500 Pleasant St., Beloit, Wis. D Sun-Thu. 4:30-9 p.m., Fri.-Sat. to 10 p.m. Bar open late. Merrill & Houston’s Steak Joint combines elegance and class for an upscale dinner experience on the Rock River in downtown Beloit. The Ironworks Hotel’s restaurant walls are adorned with historic photos capturing the early era of Beloit and its proud labor history. The interior is a compilation of reclaimed wood and paneling from the home that once stood on the property of the Beloit Corporation. The Edison lighting and white linen facilitate the historic ambiance found within the Ironworks Hotel restaurant. Since opening in 2012, the steakhouse has been serving its signature cuts and American house specialties along with an extensive drink list of wines, martinis and brews. Popular items include the Center Cut Filet of Beef Tenderloin and the sesame-encrusted Seared Ahi Tuna. Holiday brunch buffets also are served on select dates. The restaurant patio seats about 30-40 diners and offers a casual cocktail area with loveseats. Live entertainment is hosted every Friday night, and on the first and third Wednesdays of every month throughout the summer. “There’s an additional patio just to the north of the restaurant patio that serves as an outdoor space for banquets and events,” says Braatz. The restaurant is named after Orson Merrill and George Houston, the founders of Merrill & Houston Iron Works, which later became the Beloit Corporation. Much of the company’s history is documented in the black-and-white photos lining the restaurant’s walls. The banquet facility accommodates up to 200 guests and is rented for special events such as executive banquets and meetings, private parties and weddings. Indoor and outdoor seating is available and reservations are highly recommended any day of the week. 9001 N. Sand Hill Road, Galena, Ill. D Thu.-Mon. 5 p.m. Reservations required. Travel to this scenic hilltop estate overlooking the Mississippi River and discover a meal to perfectly match the picturesque getaway. The Goldmoor Inn has become a top-rated destination for travelers, weddings, private events and celebrations alongside breathtaking views in a storybook setting. Its 5,000-square-foot dining room, completed in 2007, adds a new layer of elegance to the intimate bed-and-breakfast. 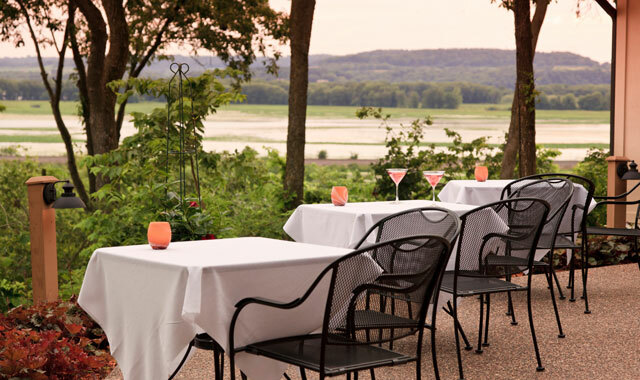 “Every seat in the Goldmoor restaurant offers a view of the Mississippi River Valley below and a beautiful sunset at dusk,” says Slobo Radin, owner of the Goldmoor Inn with his wife, Birgit. “Guests can dine in the 32-seat restaurant, which includes candlelit tables and cozy booths. Its diverse, all-natural menu features made-from-scratch dishes of international cuisines, with many available as gluten-free. Year-round, the Beef Wellington is the restaurant’s signature dish and is hand prepared every evening. The Bourbon Short Rib Chili is an ideal dish for cool summer nights, says Radin. Seafood is also a favorite on the menu, including the Paella that features locally sourced fish and crawfish. Special events and classes are offered throughout the summer, including cooking classes and classic movie nights under the stars. Visit goldmoor.com for details and reservations, or call (815) 777-3925. 200 Prairie St., Rockford. LD Sun.-Wed. 11 a.m.-10 p.m., Thu. to midnight, Fri.-Sat. to 2 a.m.
There’s no better spot on the Rock River to dock your boat, listen to outdoor entertainment and enjoy a meal than the Prairie Street Brewhouse. The brewhouse is housed in one of Rockford’s most unique historic architectural landmarks. Originally one of the first breweries in the United States, it has evolved over two centuries into the modern brewpub it is today. Its 16 faucets and two beer engines produce a changing list of world-class beers, including IPAs, lagers, stouts and saisons. There are an additional 24 faucets in the Dockside Taproom offering its staple beers, experimental brews and some guest taps. The menu is completed with classic American fare. The Turkey Club and Fish Tacos remain crowd favorites, along with the Coulotte Steak and Heritage Pork Chop. A condensed menu is served every Thursday during the summer live music series, Dinner on the Dock. After the staff noticed guests were ordering takeout from the main dining room rather than from the event menu, adjustments were made to accommodate, says Sjostrom. The staff now serves French fries and cheese curds for Dinner on the Dock. In the coming months, a new dessert item, fun cocktails and dockside popsicles will also debut. Due to the series’ popularity, a smaller version called Local Music Mondays starts in June and runs until the end of August. 1 Liechty Dr., Williams Bay, Wis. LD Wed. 5-9 p.m., Thu.-Sun. 11 a.m.-9 p.m.
On the Gage Marine lakefront, a year-round restaurant accessible by land and water has joined the longtime area boating company. A mix of casual and fine-dining seating options spread across an indoor dining room, canopy-covered deck, an elevated beach, and lounge and bar areas. From sophisticated celebrations to laid-back meals, Pier 290 delivers it all with lakefront vistas. For a more traditional, sit-down meal, 250-300 guests can fit within the indoor dining area, where they can still enjoy the lakefront views through floor-to-ceiling glass doors and windows. The space is decorated with many antique nautical pieces and items recovered from the Lake Geneva area. Pier 290’s menu is built on local food sources, artisanal drinks and made-from-scratch dishes. Lunch and dinner options include burgers, steaks, pasta and seafood, followed by homemade desserts. Produce and meat cuts come from nearby farms, including Gage Marine’s own FARM 290 and others. By July 1, a seasonal summer menu will introduce more fresh seafood and lighter dinner entrees. Third-generation owner Bill Gage oversaw the renovation and opening of Pier 290 in 2012 with hopes of making it an ideal neighborhood-friendly restaurant and event spot. A bar-side small stage hosts live music on weekend nights. Local soft rock, reggae and country musicians perform Friday through Saturday, with local mic nights every Thursday. Beyond the restaurant, visitors can check out a gift shop, surfboard and kayak rental shops, and shoreline docking for more than 30 boats on the property. 1469 IL Route 2, Oregon, Ill. LD Mon.-Sat. 11 a.m.-8 p.m., Br Sun. 10 a.m.-3 p.m. Reservations recommended. Of the many restaurant options along the 299-mile Rock River, none are quite like the Maxon Riverboat & Riverside Restaurant. Diners can choose between relaxing in the main riverside restaurant and outdoor deck or exploring the river on the authentic, paddle wheel riverboat, Pride of the Oregon. This historic, sightseeing attraction provides idyllic views of the rural Rock River from either option. About 200-300 guests can be seated inside the restaurant, where large glass windows and tiered seating maximizes the outdoor sights. Additional private dining rooms are available for rent upstairs. The spacious outdoor deck welcomes around 30 guests and puts diners in a perfect position to spot eagles, deer and other wildlife. Live entertainment from local musicians is hosted every Friday and Saturday night, weather permitting. While dining reservations are not required for restaurant dining, they are highly recommended. “Especially on Saturday nights, when we’re typically very busy and sometimes we close for weddings, it’s best to call ahead and get a reservation,” says Frank Semmerling, co-owner with wife Nancy. The menu offers traditional American dishes, from burgers and sandwiches to steaks and seafood, with new additions since the Semmerlings took over ownership in 2014. The popular orange rolls have stayed on the menu since the restaurant first opened in 1952. The 149-passenger riverboat takes adventurous diners on excursions aboard “102 feet of real river charm.” Built as a replica of the famous Rosie O’Shea paddle wheel in 1989, the riverboat is fully climate controlled and allows unique sights of the nearby Lowden State Park and its 50-foot famous statue. Seats on the riverboat are available by reservation only for lunch and dinner cruises, sightseeing tours, private weddings, reunions and other special events. Illinois Routes 178 & 71, Oglesby, Ill. BkLD daily, Br Sun. 10:30 a.m.-3 p.m. Reservations recommended. Dining at Starved Rock Lodge is the only place to enjoy the majestic sights of Starved Rock State Park and the scenic Illinois River Valley over a sit-down meal, drinks and entertainment. The restaurant menu offers a mix of traditional American fare – from omelettes and pancakes to burgers, seafood, steaks, salads and more – all served in a laid-back and casual atmosphere. Favorite picks include the Gorgonzola Nachos, Illiniwek Chicken Sandwich, Pot Roast and homemade ice cream. A popular brunch buffet is hosted every Sunday starting at 10:30 a.m. and on select holidays. For diners wanting more than window-side viewing, the Veranda opens up umbrella-covered tables overlooking Starved Rock with burgers and brats hot off the grill during warm-weather months. The westward-facing views are perfect for taking in summertime sunsets, says Casstevens. Dogs are welcome to join and enjoy the Doggie Delights menu outside. Live outdoor entertainment is hosted every Friday and Saturday night from Memorial Day through Labor Day, as well as during special events like Country Showdown on July 14. Just beyond the main dining room, the Back Door Lounge sits on the northeast side of the Veranda and creates a more casual environment for drinks, appetizers, lunch, dinner and late-night options. The popular Starved Rock Wine and Signature Ale, an American red ale exclusive to the Back Door Lounge, are served year round, along with an extensive drink list. The smaller Starved Rock Café and Trailheads Snacks & Souvenirs store also offer quick bites and snacks for hikers and diners on the go. “There’s no bad time to visit Starved Rock and witness the beautiful hiking trails, seasonal waterfalls and amazing bluff views, but I always recommend making a midweek getaway when the park is less crowded for those looking for a more restfulness trip,” says Casstevens. 5246 E. Co. Road X, Beloit. LD Tues.-Thu. 5-9:30 p.m., Fri. 4:30-10 p.m., Sat 5-10 p.m., Sun. noon-8 p.m. Whether you’re coming off Interstate 43 or taking advantage of the scenic drive through the back roads, The Butterfly Club is the perfect destination to relax and take in the picturesque hills and valleys of southern Wisconsin. This nostalgic fine dining establishment celebrates the long-held traditions of the Wisconsin supper club. Diners can socialize in the spacious lounge, sip on classic cocktails and enjoy regular live entertainment surrounded by historic Wisconsin decor of decades past. Large green plush chairs, green walls and carpeting, and mirrored ceilings preserve the vintage, laid-back feel. Mike Williamson, known for singing pop and jazz standards, performs every Friday and Saturday at 7 p.m., except for the last Friday of every month. Since 1994, Mike and Hektor Sala, the club’s current owners, have overseen the continuation of this area mainstay. The restaurant originally opened as the Butterfly Tea Room in 1924, and has gone through several owners and structural changes. Today, The Butterfly Club mixes modern amenities with old-timey themes. Beyond its extensive drink list, The Butterfly Club serves upscale American fare. Its rib and seafood selections are menu favorites. House features include the 8-oz. prime rib, served with three Honduran shrimp and a side of au gratin potatoes, and the shrimp de jonghe, a puff pastry filled with shrimp, butter, sherry, mushrooms and onions, and topped with bread crumbs. Daily specials are rotated throughout the week, including a fish fry on Fridays and a prime rib special on Tuesdays and Thursdays. The restaurant has built a one-of-a-kind reputation throughout the region. The Butterfly Club even inspired the opening of a New York retro lounge and supper club, The Butterfly, in early 2015. This entry was posted on Wednesday, June 29th, 2016 at 11:57 am	and is filed under Dining Guide. You can follow any responses to this entry through the RSS 2.0 feed. Both comments and pings are currently closed.